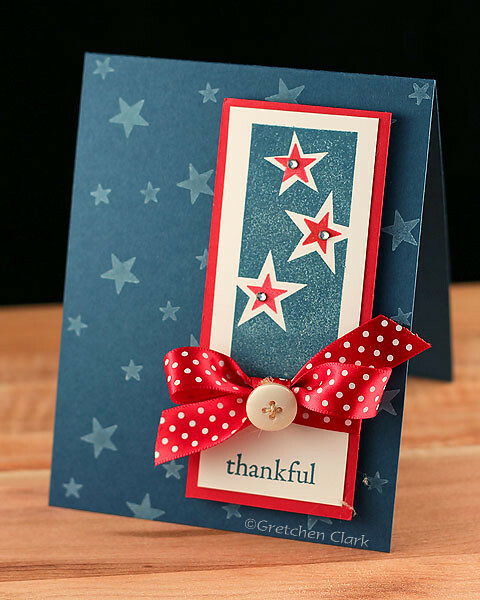 I am just poppin' in with a quick Memorial Day card. Enjoy your day!!! If you live in the USA~you know that today is Memorial Day. I just wanted thank all the men and women who have/still serve our country!! My brother Tim, served in Iraq in 1990~it was a really hard year, especially for my mom !! we thought about him every day~hoping and praying he was okay (we had little or no contact back then). Thankfully he made it home not unscathed from war, but safe. 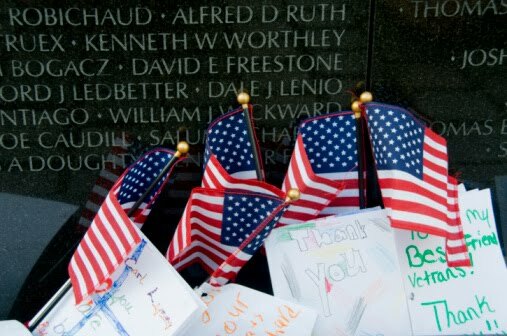 What a sacrifice these men/woman make for us, our country and our freedom and for that I say THANK YOU from the bottom of my heart!!! TGIF!!! are you ready for a LONG weekend??? *woot woot* I am!!!! Not that I am doing anything exciting~just hoping to finish up our yardwork from last weekend, and a few home improvement projects. We will most likley have a small cookout with Ashley, Nate, Josh and Jess on Monday~maybe even swim (Arizonans like the water nice and warm~at least around 78 degrees, LOL!!!). I have been trying to get used to my new light tent, and yesterday went out to pick up some flood lights (needed some more powerful ones). I was reading Carly's blog on how she takes her pictures and decided to give the cutting board base a try~it really warmed up my photo and reflected the light, but I am having a severe problem with my white balance (even did a custom WB reading), so I am still in the trial and error stage of this new light tent. How is your week going? It has been a slow week in the office I work in...so today I am getting off work at noon to get my haircut and then going to get a massage with Ashley!!! We have been talking about going for quite a while, and well, Ashley called me at work yesterday and said she booked us at 3pm~woot woot!!! I am such a practical girl, that I sometimes feel bad spending $ on that type of thing...but then while I am relaxing and enjoying myself~ I wonder why I don't treat myself more often!!! It will be fun going with Ashley~I think we are in the couples room, LOL!!! All I know is that when I get a massage that hour seems to fly!!! 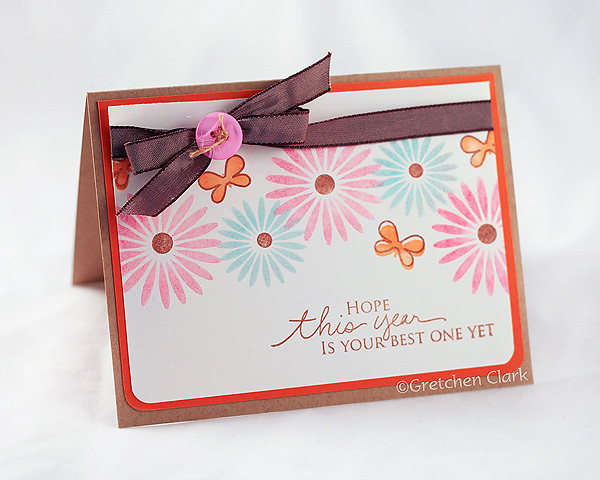 Here is a quick easy card for today...I am trying to stock up on birthday cards, since I used up a bunch last month. Hope you had a marvelous weekend! The weather here in AZ has been soooo nice...usually it is in the triple digits by now...last night it was 78~delightful!!! 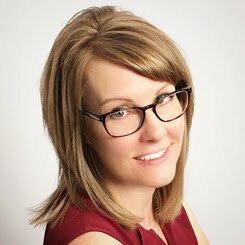 I have been checking out the Clean and Simple blog lately (right up my alley), and decided to participate in their sketch challenge. I was kind of in a stamping funk, so it was nice to have a sketch to get the creative juices flowing! 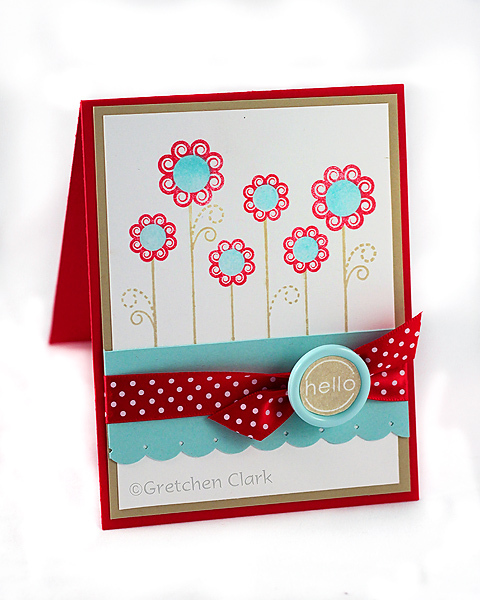 If you have not seen it already...check out this cute tutorial on Dawn's Blog??? Aren't those coffee cup cozie's the cutest??? I think some PTI felt is in my future!!! When I got home from work yesterday, Mike reminded me we had to go vote~so we went to our usual voting spot and there was no one there~then we drove to another spot where we sometimes vote at, nothing!!! Luckily I remembered another location and they had the voting signs out~after waiting in line for about 15 minutes~we found out that we were supposed to go to another spot down the road~would have been so much easier if we would have been a little more on top of things~but at least we voted!!! And I got to spend some time with my cute hubby!!! When we got home I had some time in my craft room and whipped up this card (I have a few birthdays coming up). I was happy to have a few minutes to stamp...and boy, do those PTI dies really make me happy!!! The cutting would have taken me so much longer, but had them done in no time flat!! I hope you had a great weekend~I was feeling a little under the weather, so I didn't get all my to-do items done...don't you just hate when that happens? They are still waiting for me though, LOL! 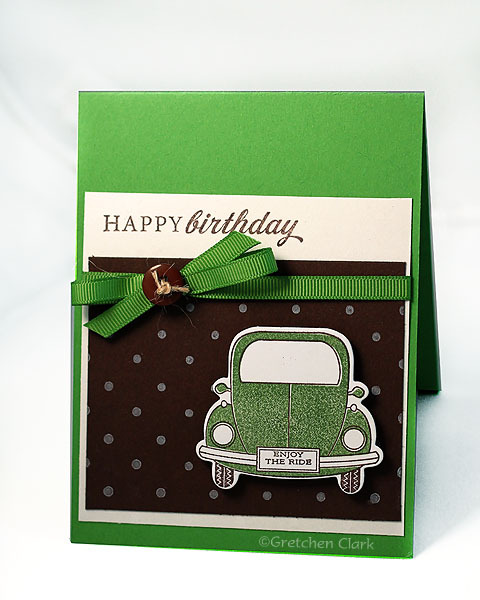 Since I wasn't feeling 100 percent, I didn't have any stamping time *sad face* So here is a card that I made for Josh's Birthday last week. Another Enjoy the Ride card. 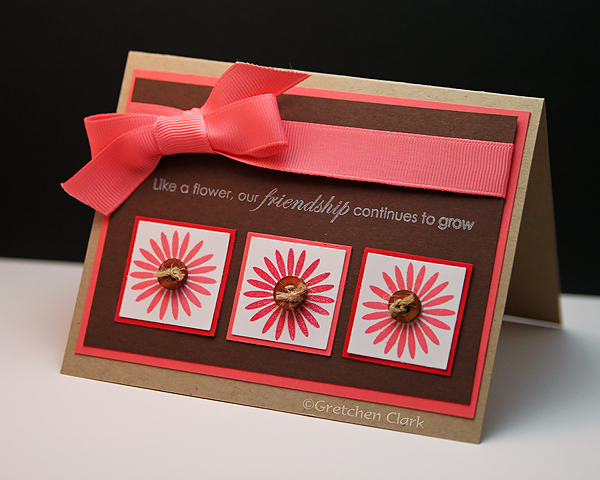 I decided to use the negative space from the die on this one. I really am enjoying these new dies from PTI!! Still having problems with my computer, I have NO memory left, so I am unable to edit some of my photos~hopefully getting a new one soon!!! 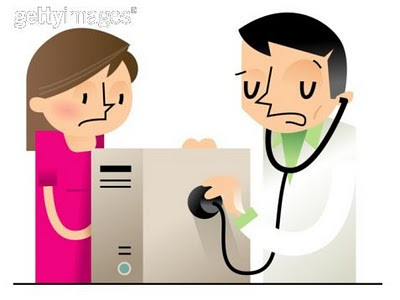 My hubby is researching and looking into getting dual monitors too (not sure how to use those, but I think I may like it!!!). He takes good care of me!! I am still trying to get the hang of my new soft box (lighting)~it is a lot bigger than my homemade one, and has lots of background colors. Thanks for stopping by~Enjoy your Monday!!! TGIF!!!! So glad it is finally Friday!!! Another quickie post for today! Here is a card I submitted a while back that did not make the cut (forgot to post it). 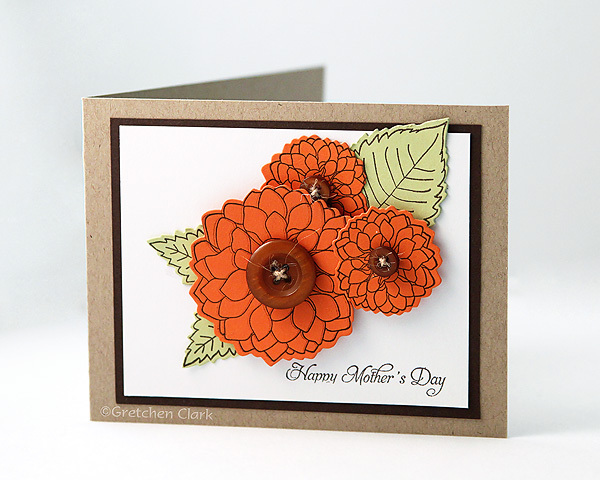 I sent it to my mom for Mother's Day, since I have not sent her a card with a smooshy flower before. 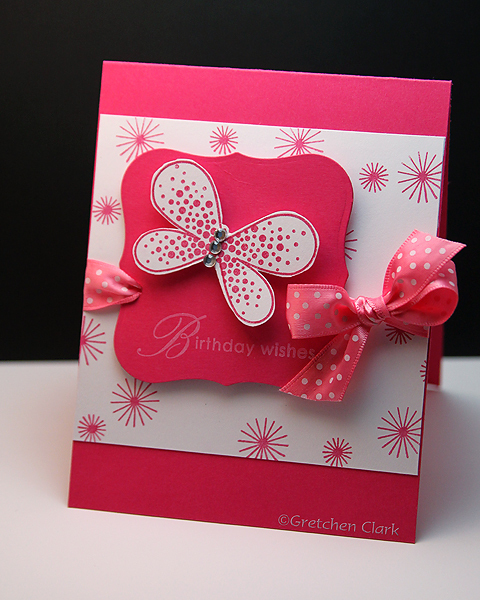 I just notice that it is very similar to this card I made a while back...guess I like the layout, LOL!!! Hi all...can you believe my hubby resurrected the computer? Although we are currently researching our next one, because I have pretty much outgrown this one and have no memory left!!! Exciting (and Expensive)!!! 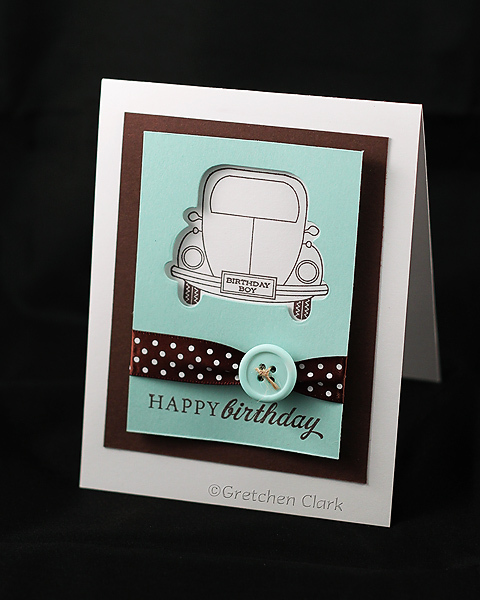 I needed a masculine birthday card, and was so happy to have gotten my new Papertrey goodies in the mail last week!! This is going to make those "boy" cards so much easier!!! 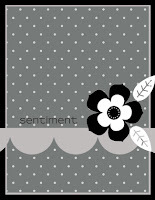 I am loving the new dies as well, so much better than cutting everything out!!! And they are pretty reasonably priced too!! I hope you had a FABULOUS weekend!!! Mine was busy, busy, BUSY!!! I won't bore you with all the crazy details, LOL! Luckily I took a personal day today to get caught up on all the stuff I have been putting off! I ordered some new PTI stuff the other day, and was so excited to have it in my mailbox on Thursday~woot woot!!! Of course I had to try it out!!! I purchased a few of the new dies, and will have to go back and watch Nicole's tutorial on getting the paper out of them, because I used my (very sharp) paper snips and tried prying it out, and accidentally stabbed my thumb!!! It bled like crazy and is still sore~Don't you just hate those paper crafting accidents!!! I had a great Mother's Day yesterday, and we also celebrated Josh's 21st birthday (pic's will be posted on my 365 blog soon), it was a good day of food, family and fun (and even a Costco run)!! Mike got me a new light tent for Mother's Day (really I bought it and told him that is what he got me, LOL! ), to take photos for my blog~I have been using my paperbox method for over 2 years and decided it was finally time to upgrade. It is a lot bigger than I had expected, so I am still experimenting with the lighting. Here is the card I made using my new goods!! Thanks for visiting!!! Happy Monday! I am working today...can you believe I worked 5 days in a row (whoa!). I am so blessed to have my Friday's off (I look forward to my day off every week), but sometimes I have to fill in for others who would like a Friday off here and there...LOL! My son in law, Nate is having his wisdom teeth out today...so if you wouldn't mind saying a little prayer for him, I am sure he would appreciate it (he is a little nervous). Ashley had it done a few years ago, and we realized how sensitive to medications she is, especially anesthesia. Hopefully it will be uneventful for Nate! We are also going to celebrate Josh's birthday on Sunday (his actual birthday 5/9), I can hardly believe that he is going to be 21!!! Where did the time go?? I am certainly not getting any older, ha ha! His birthday is always on or around Mother's Day, which is kinda neat I think!! 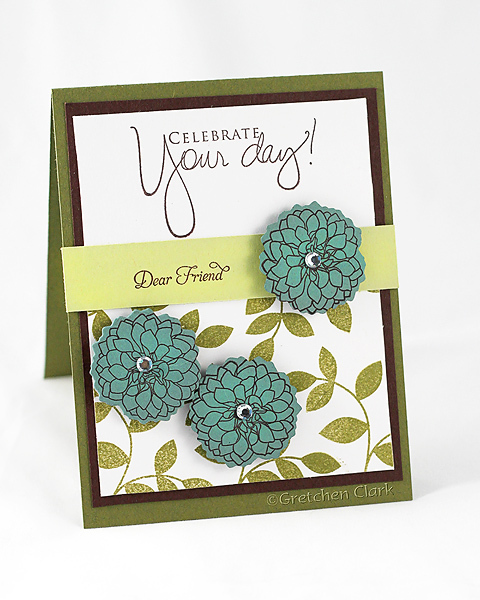 For today's card I pulled out my Floral Frenzy stamp set, and my square punch! 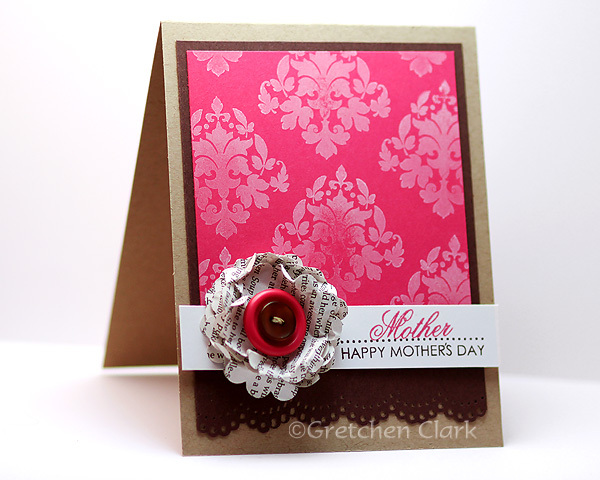 It is a pretty quick and easy card~my favorite kind!! 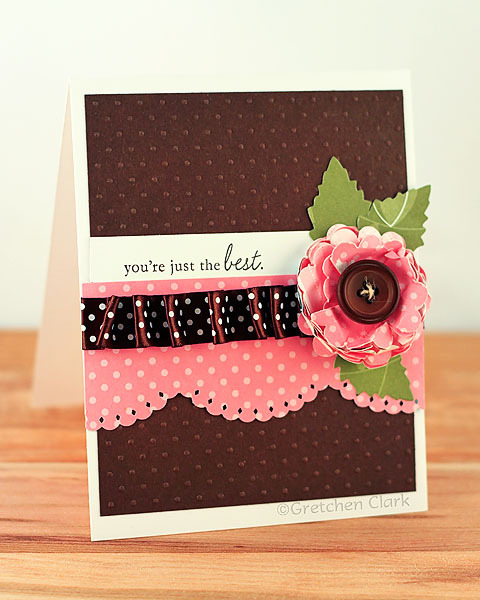 Of course no card is complete without some ribbon and buttons! Thanks for popping in! Have a Fantastic weekend!! And if you are a mom~Happy Mom's Day! 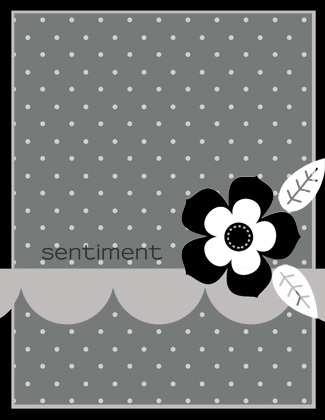 just poppin' in with a quick post today~lots on my plate this week!!! I made this card for Mike's Nana, who celebrated her birthday last month. She is quite a spunky lady!!! I hope she had a wonderful day! okay...off to work today then hopefully I will tackle a few of my to-do items!!! I just love the feel of crossing things off my list!!! Thanks for visiting! Enjoy your day!! Happy Cinco de Mayo!! Where did the weekend go??? It just flew right by me!!! I have a busy week ahead~so I hope it goes just as fast!!! A girl can hope right? Ashley needed a birthday card for her nephew "B", and I was happy to help her out!!! I don't have many kid sets, so I pulled out my Wild About You (retired) set from SU!!! 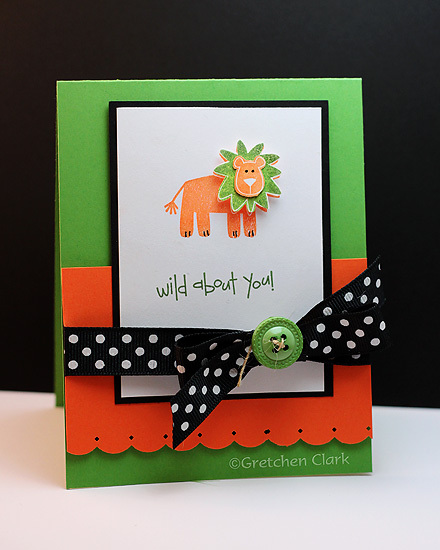 I decided to use the lion, because I wanted to paper piece his head so it would pop up a little. I used bright boy'ish colors, and Ashley said it even matched the gift card she put inside (and that wasn't even planned, LOL!). Thanks for popping in!!! Enjoy Today!